Auctions are fascinating places to be, from unusual lots to frenetic bidding, there’s plenty to see. We were at our partner, Auction House London’s first auction of 2017 at the Marriott Regent’s Park. In Part 1, here’s what we picked-up at their pre-auction networking session. To skip to the main event, see PART 2 - THE AUCTION. 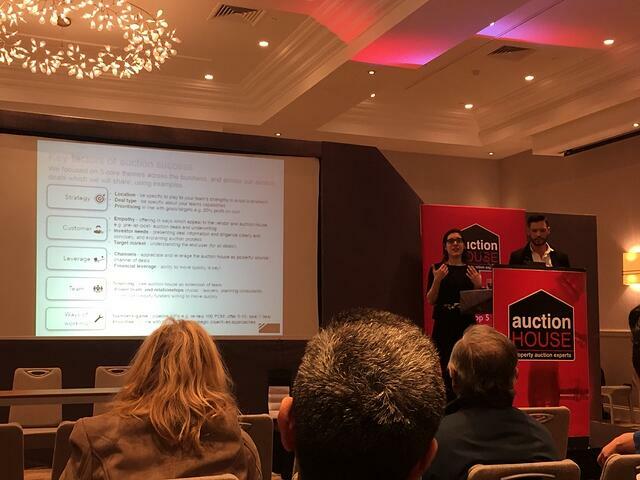 Before the auction began, a couple of hundred property people and would-be investors gathered for a couple of talks from property and auction experts, who shared their fascinating insights. Anna Harper and Stefan Canavan of Landmark Projects kicked-off with their top tips for managing property investments. Anna and Stefan had both worked as business strategy consultants for the likes of EY. Both were entrepreneurial in mindset and after leaving consulting, set-up in the property world and began working together. They’ve become developers and property managers, with projects funded by high-net-worth (HNW) individuals and joint ventures (JVs). In a few years, they’ve grown to a portfolio of 70 units, focused on London and particularly Croydon, with Manchester and Stoke new areas for growth. They have 50 units over 6 sites currently in development, with 30 properties picked up immediately before 2016’s Stamp Duty changes. This rapid growth has been financed through equity – including from HNW and JV models – and through more conventional property finance debt. 28 of those 70 units have been bought via auction. Get the investment case right: to persuade HNWs to invest, you have to make the financial case and demonstrate likely returns in hard cash. Know your maximum purchase price, transaction costs and conversion costs. Compare with realistic property valuations and demonstrate that there’s good money to be made between the two. With Stamp Duty and BTL tax changes, you have to add more value to properties when you do them up, to make the returns attractive enough. Plan your acquisition strategy: searching for the right properties to target is a major effort and cost. You’ll need to look at 100 properties to offer against 10 and ultimately buy 1. Underwriting buy: some auction houses will let you pre-agree an “underwriting” price to buy, but the property still goes into auction. If the price in the room is less than the underwriting price, you’re obliged to buy, but it can still sell to someone else in the room. Do your auction groundwork and prepare for the unexpected: do as much legal review and investigative work, including a full check on the legal pack, viewing the property, etc. as possible before you buy. Through these experiences, they’ve honed their tactics. For example, they like B1 Commercial properties. The B1 class makes them easiest to convert to residential use. And, as there are no minimum flat size requirements on B1 conversions, you can often fit more units into the space, maximising returns. The unusual opportunity here is to create an under-built basement flat, beneath the existing block. Clearly, planning permission. The advantage to the selling freeholder is that they get the small upfront sale price, but then ground rent & service charges each year and an entire additional flat when the lease reverts after 125 years. Here, the vendor makes straight cash. For the buyer, the maths is clear as build costs can be well-estimated beforehand due to pre-prepared plans. By working to the Gross Development Value (i.e. how much it should be worth when finished) and desired profit margin, bidders can calculate their maximum bid price before the auction. In this case, sale prices for equivalents in St Albans were £350-400,000. The winning bidder clearly felt that £120-170,000 would be enough to cover building and profit. A widow decided to sell as her husband died before his project could be completed. With no planning permission, development value for the strip of land is only the value a bidder can hope for if they’re able to get planning permission. Valuers rarely consider ‘hope’ value, but a buyer may factor it in. The winning bidder focused on converting the house and selling that part for over £500,000 and using funds generated to develop the land if planning was granted. That meant the project still made money, even if ‘hope’ value turned out to be nothing.